Sussex Transport carry out regular movements of artic curtainsider, moffett and flatbed loads to Manchester and the surrounding areas – this means that we are always on the lookout for other Haulage Companies or Transport users that may have regular return loads that they struggle to cover back to London and the Home Counties. 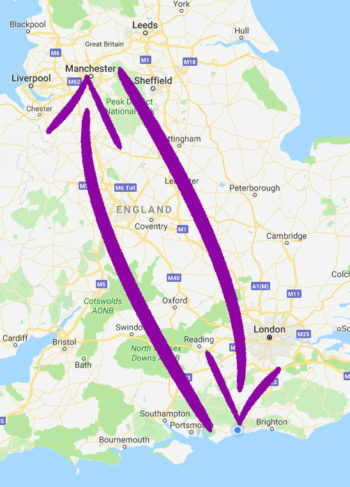 We like to build long term relationships with customers and other reputable hauliers who could help supply us with regular back-loads for our vehicles… backloads don’t have to always be out of Manchester, these return loads can be collected anywhere in the surrounding areas or on route back to the South of England (Sheffield or Oxford for example). We will offer extremely competitive rates for those deliveries back to Sussex, Surrey, Hampshire, London and Kent. Alternatively, we could always collect loads for delivering to other parts of the country if it benefits both parties. Backloads allow Transport Companies to reduce environmental impact, deliver their customers loads at reduced rates enabling them, in turn, to offer better or reduced rates to their customers, as we know its human nature to always look for the cheapest rate but with a first class service, we know that this isn’t always practical. By reducing our customer’s costs and looking at the bigger picture it could sometimes be the difference between gaining or losing that business – this way we could help you to achieve your customer’s deadlines without jeopardising your service levels or your reputation…. So what are you waiting for – get in touch and let’s do this together…. Teamwork!! 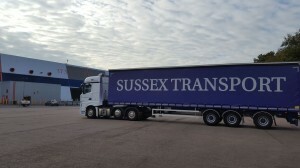 This entry was posted in Artic Transport, Delivering to..., News, Surrey Road Haulage, Where are Sussex Transport going..., Where are Sussex Transport..., Working with... and tagged Artic transport, backloads, Environment, hampshire, London, manchester, Oxford, Sheffield, Surrey, Sussex. Bookmark the permalink.